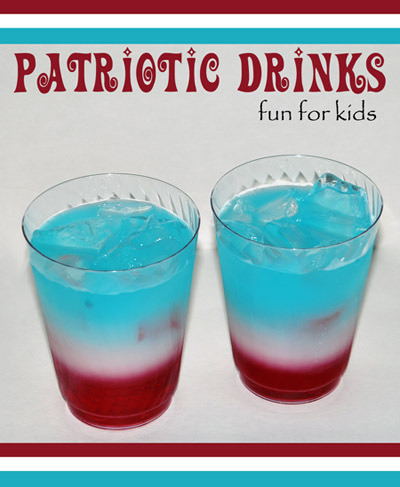 This red, white, and blue layered drink I made for the kids was “so cool” according to them. I made it as a 4th of July fun food idea. It’s simple to make! The trick is to buy juices, sports drinks, etc. that all have different amount of sugars in them. You want the one with the most sugar at the bottom. Start by pouring a small amount of the one that has the most sugar in it. Then add ice cubes. Slowly pour the next sugariest drink directly on top of the ice. If you pour too fast, you may accidentally mix the 2 liquids together. Add the one with the least amount of sugar at the very top. 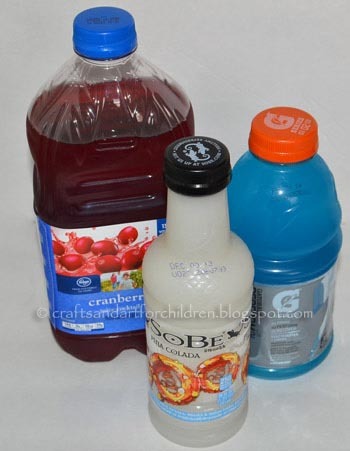 We used cranberry juice, pina colada flavored Sobe (Sobe idea is from In Katrina’s Kitchen), and blue Gatorade. This also makes a fun science experiment. Try different colors and flavors for the different layers. Make 2 or even 5 layers – the combinations are endless! 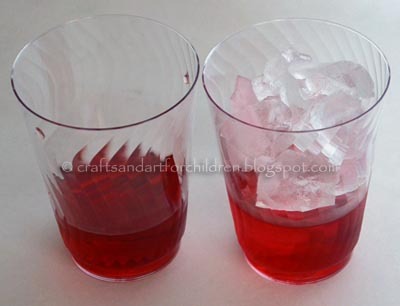 What Fun Food Ideas or Cool Science Experiments have you tried? Amanda is an ‘artsy momma’ to 2 kids who love making crafts just as much as she does. Follow their creative journey over on the blog titled Artsy Momma. Besides crafts, they share fun food ideas, hands-on learning activities, mommy DIY, + lots more! If you love handprint art, head over to their Fun Handprint Art blog where you will find hundreds of their projects all made with little hands and feet. I’m browsing through all your posts and I love all your ideas! This one has to be my favorite so far. Can’t wait to try this for my kids. They’re going to love it! Thanks Stephanie! I want to try making your sweet potato muffins for the kids – they love sweet potatoes! Join us for more creative fun! Search for more artsy ideas!